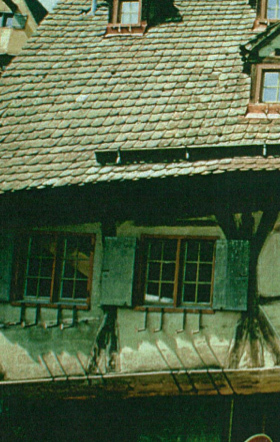 The „Schiefes Haus“, or crooked house, is the most frequently photographed former town house in Ulm and dates all the way back to the year 1406. 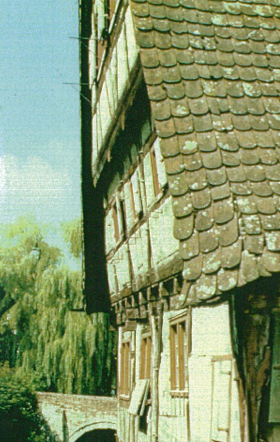 In 1443, a fundamental extension of the house in the late Gothic style was completed. Initially it had measured only half its current length, but the extension enlarged it to the current size and towards the creek Blau. The north wall of the house stood on steady gravel. The south wall, however, was founded on much less firm ground. As the foundation of this house side slowly gave way, the fundament moved with it and the house sunk into a tilted shape. To save it from eventually "swimming apart", the house was first supported by three additional pillars, before the wooden south wall was replaced by a stone wall in the mid 17th century. In around 1800, also the wooden north wall was replaced by a stone wall. At the end of the 19th century, the wooden pillars on the south side were given concrete fundaments. Despite all efforts, however, the house continued to tilt and turn on the south side - due to moisture issues in the roof and the cross beams, and the extreme weight of the first floor that had been filled up to counterbalance the tilt. Thanks to the prominent first floor of the building that was secured by wooden props, it was possible to add a gallery for the tying up of wooden boxes and the mooring of riverboats. Today, the historic landing has become a "swimming" gallery on the Blau. The glass floor allows a direct view of the fundament of the former fish basin. In the course of the restoration and renovation works in 1994/95, the house's fundament was again reinforced, the original bearing structure reconstructed and the entire roof- and ceiling structure stabilized. Additionally, all weight was moved to the north side - as far as possible - and secured. The wood paintings on the cross beams on the first floor were restored and the vaulted ceiling reconstructed. Today's condition of the "Schiefes Haus" brings across the history of the building, thanks to both the retention of the tilted floors and the minimized visibility of modern technology, while it offers all the modern comfort and amenities to our guests.